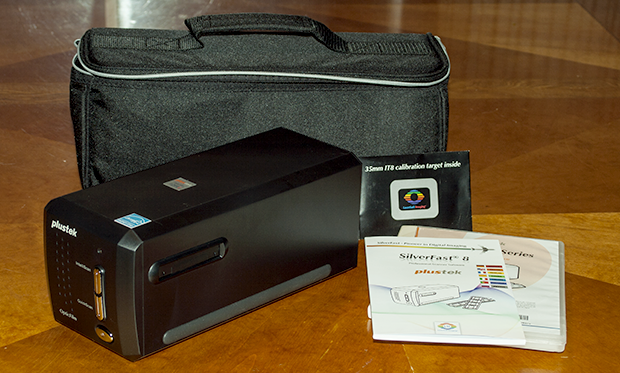 My New Slide Scanner With Manual, Software, And Carrying Case. In the years that I was using the Canon Elan IIe, I took thousands of shots on professional grade color slide film. In the beginning, I paid a local printing company to scan them on their high-end flatbed scanner. It really did a nice job, although it was too costly to scan all my images. I had to pick and choose based on my needs at the time. I already had an Olympus dedicated film scanner, with an optional APX film adapter, but it was a consumer product, and while it did a nice job with my APX film, it didn’t give me professional quality with the 35mm slides. Years later, I was loaned a Nikon LS-1000 scanner, and nearly all of the photos I have scanned from slides were scanned with the Nikon. I purchased SilverFast for the Nikon, and was able to get scans that were actually better than those I had been paying for with the local firm. I still have that Nikon. The gentleman who loaned it to me changed jobs and we lost touch. But technology moves on and the Nikon, which uses a scsi interface, is not supported in Windows XP let alone Windows 7. In order to use it, I must run Windows 98, which is on a very slow computer. A computer I haven’t retired only because of the Nikon and my old reliable flatbed that also will not work with the newer operating systems. As Digital becomes commonplace, and fewer photographers use film, film scanners are only going to become more and more expensive. I decided I had better invest in one now, or in a year or two, there wouldn’t be any affordable film scanners available that also provided a good quality scan. After much research, I decided on the Plustek OF8200i. The reviews on this scanner are mixed. But most of the complaints center around the Silverfast Ai8 software. I admit, there is a steep learning curve. But having used an earlier version with the Nikon scanner, I am confident I’ll be able to master it in a relatively short time. I opened everything up when it arrived, and installed the software right away. I set this up on my laptop because it is a much new computer and significantly faster and with more memory than my desktop. That allows me to use the laptop dedicated to scanning, while continuing to do other work with the desktop. My first scanning effort was a bust, however. I need to take the time to learn the software all over again, and in my hurry to play, I skipped over steps I didn’t remember how to do. Haste makes waste, and this was no exception. But I can say, mechanically, the scanner is working. I needed to verify that right away in case there was something wrong and it needed to be returned. Now it is up to me to reacquaint myself with the scanning software, and determine the best settings to get great scans from my slides. I am quite optimistic, and excited about my new toy… er, tool! At some point, after I’ve started scanning my slides, I’ll come back here and give a detailed review.